Beneath the Acropolis museum are the ruins of an ancient Athenian neighbourhood. Clearly visible are the remains of streets and houses, bathhouses and workshops. In what was initially considered a controversial move, the museum was constructed on the archaeology in such a way that enables visitors to look onto these ancient foundations. 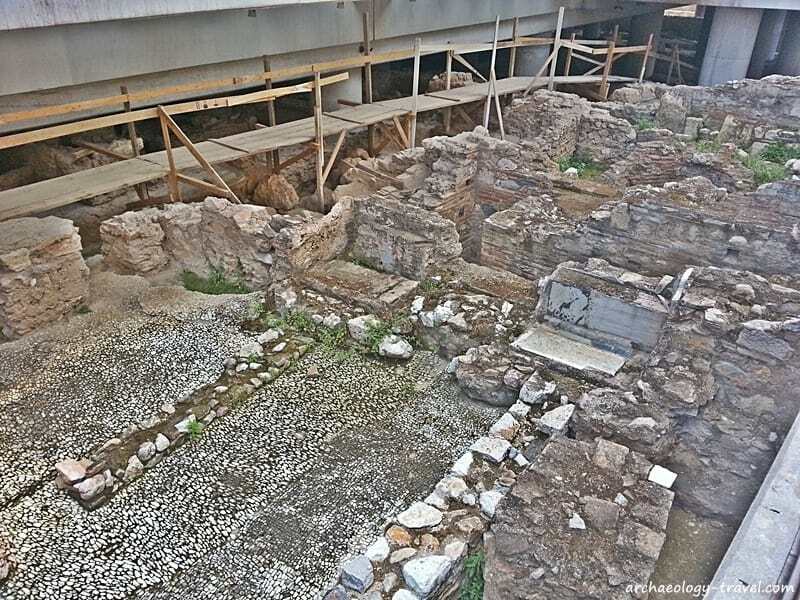 Although much of what you can see today dates to the late antiquity and early Byzantine periods (7th – 9th century AD), there are still traces of Athens from the fifth century BC. 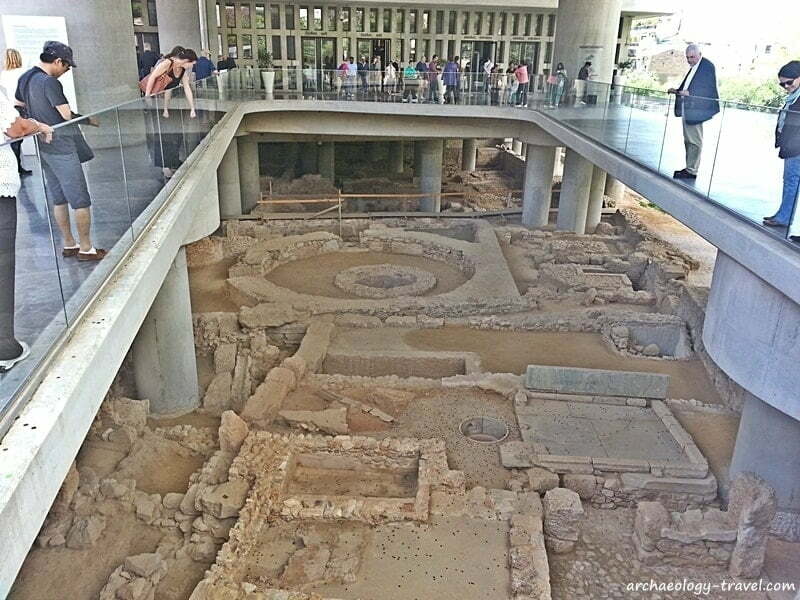 Looking over the ruins beneath the Acropolis Museum onto the Acropolis itself. By the 1970s, it became obvious that the late nineteenth century museum on the Acropolis was inadequate in all respects. The building itself could no longer accommodate the quantity of artefacts being recovered on the Acropolis, while the ever increasing number of tourists placed an added strain on the facilities. In 1976 a new site was identified in the historical area of Makriyianni, which is the present location – 300 metres south-east of the Acropolis. 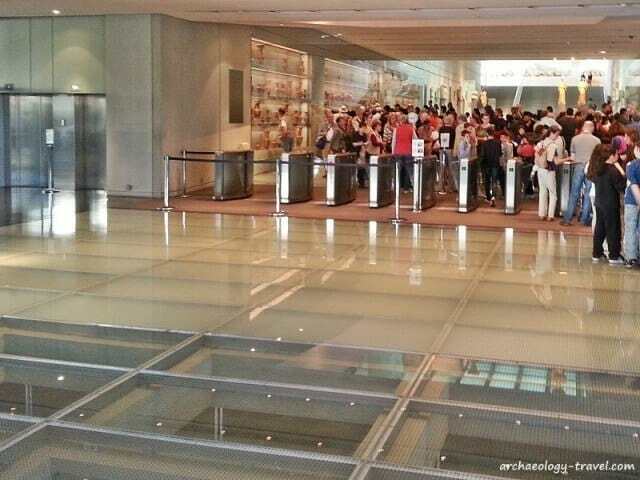 After a number of delays and changes to plan over a period of 31 years, the new Acropolis Museum finally opened its doors to the public on 20 June 2007. One of the delays was the result of the discovery of archaeological remains on the proposed site in Makriyianni. In 1989 Melina Mercouri, the then Minister of Culture, had initiated a third architectural competition for the new museum. The two previous competitions (1976 and 1979) having failed for various reasons. A winner was chosen and construction was all but ready to begin when the remains of the ancient urban settlement were reached during the initial excavation of the building site. A fourth competition was held in 2000, in which tenders had to take the archaeological remains into consideration. 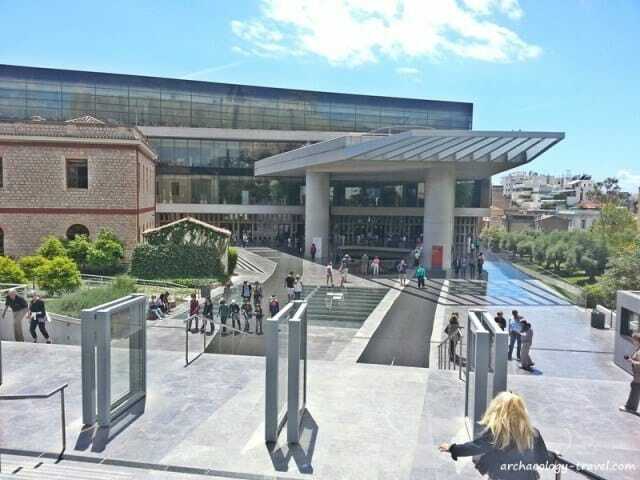 And it is the design that won that competition, by Bernard Tschumi and Michael Photiadis, that we see in Athens today. Through the use of pillars the contemporary building floats above the archaeological remains. Outside the museum, visitors look down onto the archaeology, while inside the museum glass floors enable you to see exposed sections of ancient architecture. The complexity of the site is easily seen in the plan of the ancient buildings below, where buildings of different periods are colour coded. This plan is on the only information board, and it is worth taking a few minutes and exploring the ruins beneath the museum. Below are some of the features you can see. The dashed, white outline is the approximate location of the museum. Walking off Dionysiou Areopagitou Street down the stairs and on towards the museum, you pass over a section of the walkway made of glass. 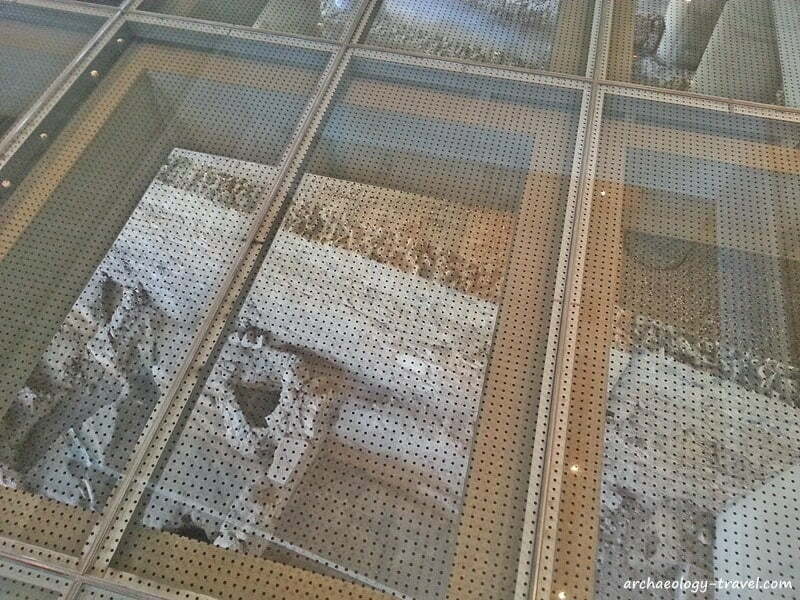 Here you look down onto polychrome mosaic floors – these were being restored when I visited. Further along the walkway towards the entrance, an elliptical hole in the walkway exposes some well preserved remains from the 7th century AD. The large circular structure, into which visitors throw coins, are the foundations of a Byzantine hall-tower (1 on the plan). Once inside the museum, in the entrance foyer/ticket lobby, just before you go through the turn-styles into the first exhibition space, the glass floor allows you to look down onto 5th century AD walls. Through the turn-styles, most people’s attention is grabbed by the stunning collection of artefacts from various sites found on the slopes of the Acropolis – including some of the many sanctuaries. But here too the floors are made of glass, with the remains of Byzantine age halls (8 on the plan) directly below. Along the north side of the museum, to the east of the entrance, 7th century AD Byzantine remains of a small private bath (4 on the plan) and a hall (7) can be seen. Although the focus of the museum is the collection of artefacts from the Acropolis – the various sculptures of the Parthenon understandably being the jewel in the Museum’s crown – the archaeology on which the museum is built should not be overlooked. 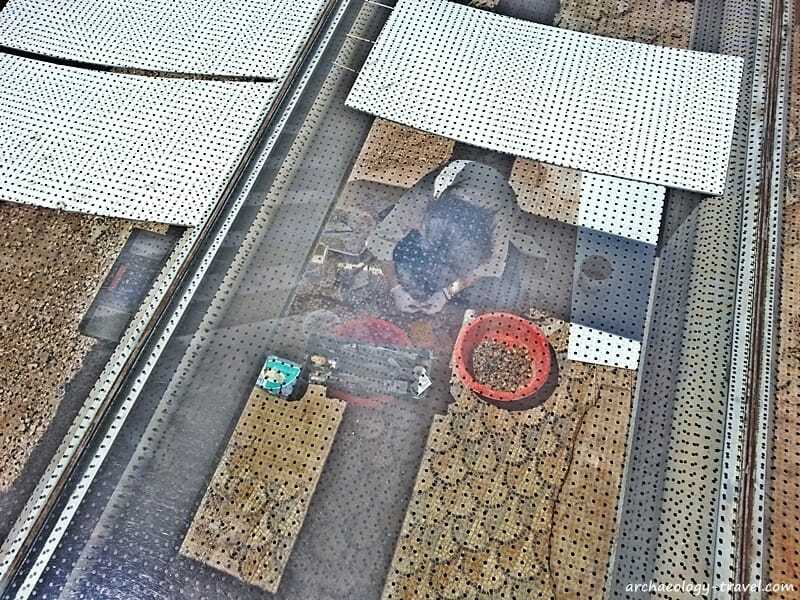 Currently, you may very well have the impression that all you can do is peer down and look at the circular walls of hall-tower or a mosaic floor. Unfortunately, today this is largely the case; there is very little available information about the ancient neighbourhood. 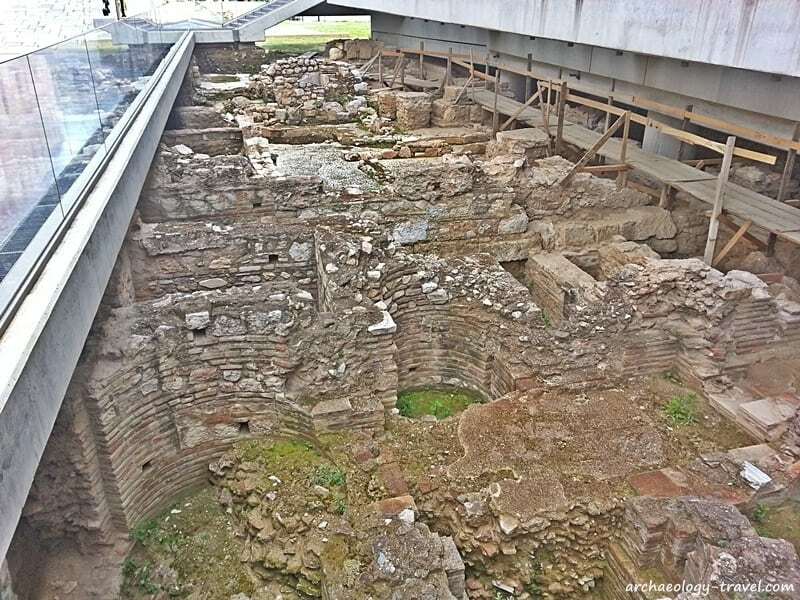 This is partly because excavations of the archaeological site beneath the museum are ongoing. Once the archaeologists finish their excavations, the site will then be made ready for visitors. Ramps and information panels will be added that will allow visitors to do more than just stare down onto the remains of ancient architecture. 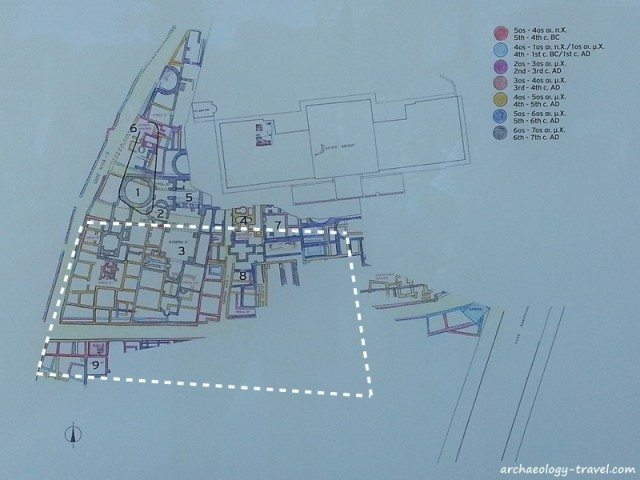 When the archaeology was first discovered on the intended site for the museum, many groups felt the museum should be relocated. Others felt that the very presence of these remains made this an entirely appropriate location for the museum. 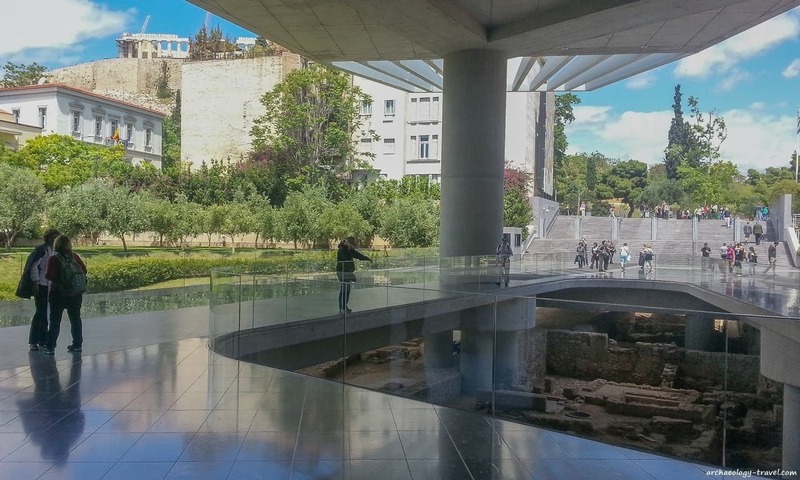 The in situ remains of the ancient Athenian neighbourhood gives an added dimension to the visitor experience of the Acropolis Museum. Throughout the ages the Acropolis has been an important landmark in the city. There is widespread agreement, the number awards the museum has received bears this out, that the state-of-the-art museum is the perfect showcase for the numerous objects that have been recovered from various temples and sanctuaries on and around the Acropolis. When excavations of the ancient Athenian neighbourhood are complete, visitors will be able to learn about the history and religious significance of the Acropolis, at the same time as understanding something about the daily lives of the people who lived in the shadow of the sacred rock from the 5th century BC to the 7th century AD. 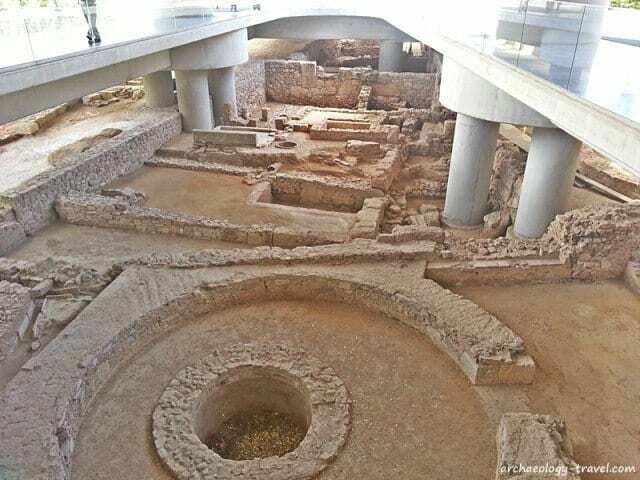 During my stay in Athens, I am the guest of the Herodion Hotel, located in the very ancient neighbourhood the remains on which the Acropolis Museum is built. 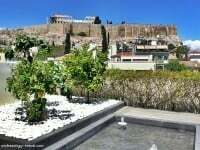 Besides the glorious view of the Acropolis, the hotel is literally a stone’s throw from the Acropolis Museum and a block down from the the pedestrian walkway of Dionysiou Areopagitou Street – the best way to access the city’s most visited archaeological sites. 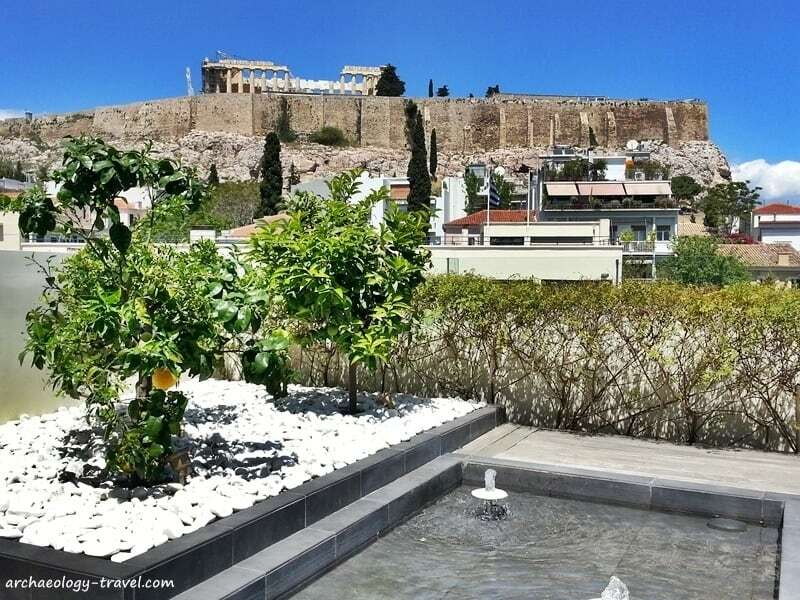 When making a booking, request a room on the northern side of the hotel – waking up to the Acropolis is magical!